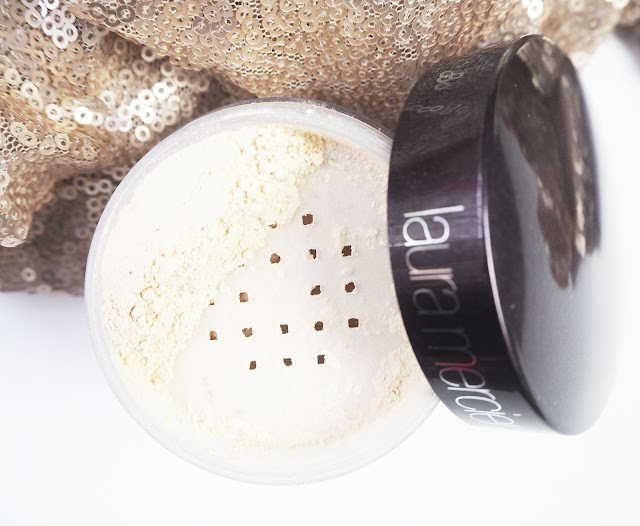 I think we can all agree that a lot of hype surrounds the Laura Mercier Translucent Powder and not so long ago this was the setting powder to have. Initially I didn't buy it, that wasn't because I didn't want it but because I could never find it in stock! I eventually picked it up in a local department store a few months ago and have been using it on and off ever since. For the £29 price tag you get 29g of product that comes in a sturdy, plastic tub with one of those sieve things in the lid (I have no idea of their official name!). The idea of this powder being translucent is that it will work for all skin tones- hooray! I've actually used this on a few of my friends when doing their make up and it worked beautifully on all of them. It also means that its not going to change the colour of your foundation which is an absolute P in the A. The powder itself is very finely milled making it super soft and silky feeling, exactly what you want in a setting powder. I find that just a small amount of this does the trick and I apply it using a small setting brush, usually the Real Techniques one. Day to day I've been sweeping a bit of this under my eyes, on my t-zone and on my chin- the parts of the face that usually need a little extra help. This powder became famous as one that worked extremely well for 'baking', I have to admit I don't do this day to day but on special occasions I go all in with the baking and this powder helps to brighten and lock make up down for hours. My annoyance with loose powders in the past has been that some of the 'translucent' ones leave a white cast on your skin, even when you've just gone in with a light dusting. Of course I was super happy to discover that this one blends in with your base without making you look like a ghost! The true test of a setting powder is whether it keeps your make up looking good all day long and for me I definetely notice a difference on days I use this. I have oily skin and have found that it works wonders at keeping the oil at bay, I may still need to touch up my face once in the day depending on which foundation I've gone with but thats more of a comfort thing than me actually needing to because my make up is slidng off my face. Overall, do I think this product deserves its cult status? Yes, I do! I love it and think its well worth the pennies. What are your thoughts on this powder?